In May 1871, Charles William Eliot had been president of Harvard College barely two years, and a widower just as long. He needed a break, for himself and his two young sons, a “thorough vacation” in the open air, as he wrote to a friend. He found means in Jessie, a 33-foot sloop, and began planning a sailing and camping trip to Maine, “down Mount Desert way.” Described as “a very pretty boat and tolerably fast,” Jessie made a few warm-up excursions around Boston Harbor and raced with the Dorchester Yacht Club before leaving for Maine in July. The details of their journey are featured in the latest issue of Maine Boats, Homes & Harbors magazine. In the article, I explored how that first sailing vacation, and the ones that followed, instilled in Eliot, and especially his son Charles, a sense of place and understanding that would have a lasting impact on the Mount Desert region and beyond. Young Charles Eliot would lead the first natural history surveys of the island as “Captain” of the Champlain Society in the 1880s. 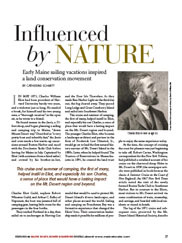 And when he founded The Trustees of Reservations in Massachusetts in 1891, Charles created the land trust model that would be used to protect Mount Desert Island’s diverse landscapes, and other places around the world. For the Eliots, sailing and camping on Frenchman Bay was a formative experience that would change their lives, as well as make it possible for millions of people to enjoy the same experience today. Previous Holtrachem mercury – It’s still here.